A feature on the floor of the Baltic Sea that was discovered last summer by Swedish treasure hunters is making headlines once again. The latest media coverage draws upon an hour-long radio interview with Peter Lindberg, head of the Ocean X Team (which made the “discovery”), in which Lindberg delivers a string of cryptic and titillating statements about the “strange” and “mysterious” seafloor object his team has been exploring for a year. “If this is Atlantis, that would be quite amazing,” he said. Atlantis is a mythical underwater city referred to in ancient legends. In other words, an expert appears to back up their claims that this seafloor object is unexplained, and perhaps is an Atlantis-like ancient building complex. To double check, Life’s Little Mysteries consulted that expert. 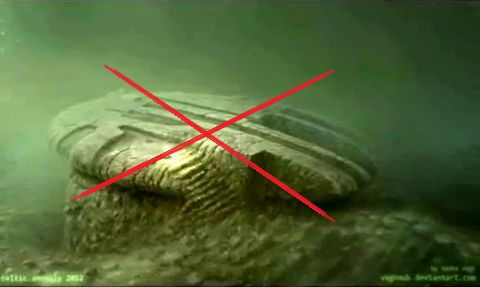 Turns out, neither he, nor any of the other experts contacted about the Baltic Sea object, think there is anything mysterious about it. Glaciers often have rocks embedded in them. At the end of the Ice Age, when glaciers across Northern Europe melted, the rocks inside them dropped to the Earth’s surface, leaving rocky deposits all over the place. These are sometimes called glacial erratics or balancing rocks. The expert analysis suggests this is just a glacial deposit that the Ocean X Team “discovered” in a low-resolution sonar scan. Widespread media coverage, fame and a worldwide Internet following have since ensued. Lindberg laments the fact that no organizations will sponsor his investigation. Some organizations have supposedly told him funding the dives isn’t worth their time because the anomaly “might be something very unexplainable.” He asks people to support his and his fellow divers’ work by purchasing apparel from the Ocean X website.